What is the California Children’s Services (CCS) Program? The California Children’s Services (CCS) Program provides diagnosis, treatment, and medical case management to 190,000 children under the age of 21 with special health care needs who are enrolled in Medi-Cal, are low income, or have catastrophic medical care costs. The program serves the state’s most medically fragile pediatric population, including children with conditions like cancer, diabetes, and congenital heart defects. CCS Provider Standards Ensure High Quality Care. CCS providers, clinics, and hospitals are carefully screened, extensively credentialed, and subject to detailed regulations to protect quality and ensure access to appropriate care. Program nurses provide intensive case management covering all aspects of a child’s care for their CCS condition, sometimes working with children from birth to their 21st birthday. CCS Benefits Include Supportive Services. CCS provides families with transportation assistance, and provides critical linkages to social services to help families with food or housing needs. CCS Covers Vital Health Care Services. 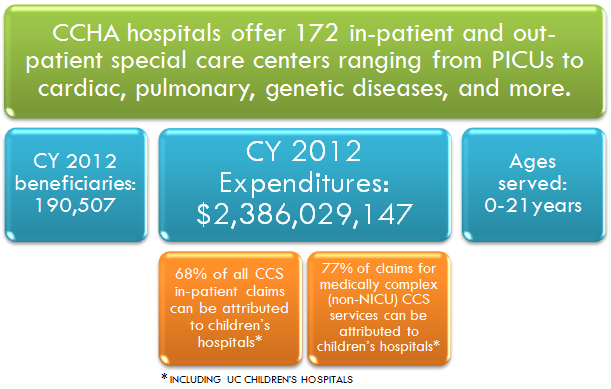 CCS eligible children have complex medical needs that can be costly and difficult to coordinate. The CCS program can pay for doctors visits, hospital stays, surgery, physical and occupational therapy, lab tests and x-rays, and orthopedic appliances and medical equipment. CCS case managers work with families to help them manage the complexities of caring for their children. After two years of negotiations between stakeholders and the State, a compromise was reached on the future of the CCS Program in 2016. That compromise is incorporated into SB 586, which creates the “Whole Child Model” for CCS. SB 586 was signed by Governor Brown in September of 2016. Under SB 586, CCS services will become the responsibility of Medi-Cal managed care plans only in counties that are operated by county organized health systems, starting in 2017. The bill requires that these plans must meet robust readiness criteria prior and utilize existing CCS program standards when making treatment decisions. Importantly, the bill includes a requirement for an evaluation of the Whole Child Model prior to any further geographic expansion of the approach. CCHA is working with the Department and other stakeholders to ensure that the high quality of the program is maintained and children do not lose access to important specialty providers and supportive services as this legislation is implemented. You can find more about the Advisory Group’s work, including past agendas and meeting materials at the Department’s website.